Welcome to beautiful, friendly Tisarstrand, a small, cozy, 3-star family campground. 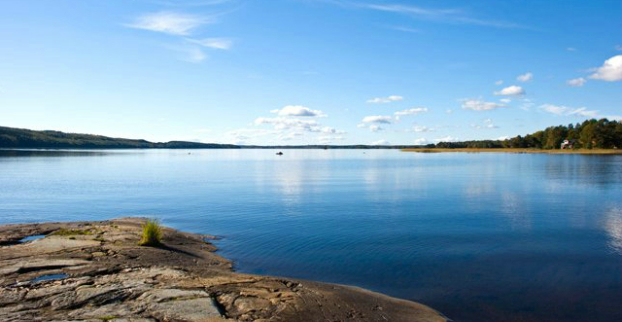 The campground is beautifully situated in natural surroundings at Lake Tisaren. It offers opportunities for lovely strolls in the environs; swimming; fishing; and interesting excursions to sightseeing destinations and cultural events. Recently constructed service buildings, a handicap-accessible toilet, and baby care area. Communal room with TV, kitchen with stove, oven, microwave, refrigerator and freezer. Hot water for washing dishes included in the price. You can rent a boat, buy a fishing license, and more. In Kullbotten lodge, we arrange traditional barn dances, theme nights, karaoke, guest performances, pot luck suppers, and more. . It is also possible to rent the lodge for private gatherings. There are 85 campsites of which 38 must be reserved for the entire season; 78 have electrical hookups. In addition, we have 5 modern cottages, with roomy, fully equipped kitchens, two bedrooms, shower, toilet, a patio that faces the lake, and a canoe. Cottages are equipped for 6 people, with refrigerator, oven, coffeemaker, TV, VCR, kitchen utensils, glasses, and china. Bring your own bed linens or rent them at the reception desk. Look for the signs for Tisarstrand, located about 10 km from central Hallsberg. Checkout: no later than 3pm or you will be charged for another day. Rent a campsite or cottage for the entire season or part of the season at a reasonable price. Call for more information.